I know the rugby world cup is over and The Six Nations doesn’t start until next February, so why am I writing a blog about scrum? Well for starters, it’s not that type of scrum. The scrum Aurion Learning is seeking to form, implement and adopt is an agile framework for completing complex projects. Agile project management refers to methodologies for developing complex software; characterised by flexible and adaptive working processes, rapid response to change, iterative and incremental development. 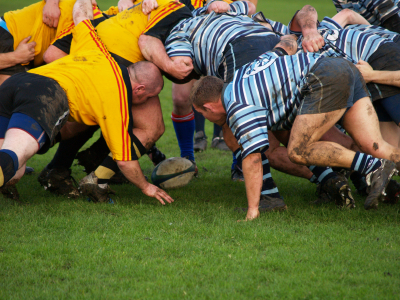 Jeff Sutherland and Ken Schwaber created the scrum process in 1993, and the name “scrum” comes from a 1986 study in which Takeuchi and Nonaka compared high-performing, cross-functional teams to the scrum formation used by rugby teams. Scrum is now used by 75% of agile teams worldwide. The team has a certain amount of time, a sprint, to complete its work – usually two to four weeks – but meets each day to assess its progress (daily scrum). Along the way, the Scrum Master keeps the team focused on its goal. At the end of the sprint, the work should be potentially shippable, as in ready to hand to a customer, put on a store shelf, or show to a stakeholder. The cycle repeats until enough items in the product backlog have been completed, the budget is depleted, or a deadline arrives. Which of these milestones marks the end of the work is entirely specific to the project. No matter which impetus stops work, Scrum ensures that the most valuable work has been completed when the project ends. Scrum originally was formalised for software development projects, but works well for any complex, innovative scope of work. The possibilities are endless and the framework is deceptively simple. In 2012, I hope to complete and deliver several large scale product development projects for Aurion Learning using scrum. So what qualifications or skills do you need to rollout scrum in your organisation? Well first of all you need a Scrum Master. That’s me (second right). 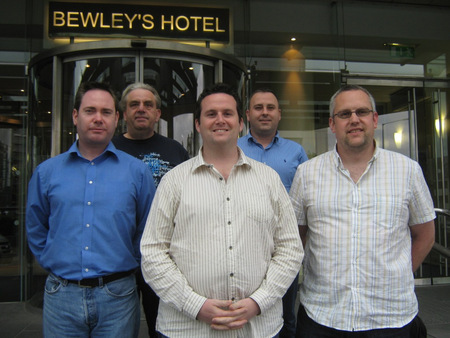 I gained my CSM certification in Dublin, Ireland on June 05, 2009 under the excellent tutelage of Jens Ostergaard. It’s now time to walk the walk. It will take a while to adopt and run smoothly and will certainly require a change to the status quo, but I have great hopes for its success and hopefully we can achieve the Toyota effect: (well-run scrums) four times industry average productivity and twelve times better quality. I will provide you all with an update at the end of the first quarter and let you know how our scrum experiment is progressing. If you would like to know more about scrum, check out the following video and website links which will give you all the information and certification details you require to get started.